Surfing in South Africa was rumoured to have started in the early 1920’s in Muizenburg, Cape Town. An American navel vessel returning to America after World War One stopped off in Cape Town and two of the United States Marines disembarked and took to the waters of Muizenburg on a solid wooden “Hawaiian” style board. Muizenburg corner soon became a hot spot with standup surfing between the 1920’s and 1930’s. Cape Town may have seen the start of standup surfing in South Africa, but the warm waters of Durban is where it really took off. In 1938 after the Empire Games in Sydney, Australia, the South African swim coach and a Durban Surf Lifesaver, Alec Bulley visited a beach in Sydney to see what lifesavers were up to and saw the guys standing up on a rescue craft they had constructed. He gave some sketches to Fred Crocker who later built a ski. World War Two came around and slowed down the progression, but by mid to late 1950’s Crocker’s Skis were being used in Life Saving competitions and soon established a community of avid standup wave riders. The South Africa Surfing Heritage visitor’s center on Durban’s North Beach is a must see for anyone who wants to find out more about surfing in South Africa. South Africa has always had its fair share of talented surfers, as soon as surfing become a professional sport in the 1970’s. Shaun Thomson, who grew up in Durban and became a standout legend in the famous waves of Jeffery’s Bay in the 60’s and 70’s, played an integral part in where professional surfing is today. Thomson won the coveted World Title back in 1977 and paved the way for future South African surfers. What's the surf like in South Africa? A surfing holiday in South Africa can easily turn into some of the best waves you will ever experience in your life! Surfing South Africa’s vast coastline and exploring its untouched coastal gems is truly a trip you will never forget. With its warm sunny climate, majestic scenery, pristine white sandy beaches and perfect waves it is truly a surfer’s paradise. As you can see below there are 5 main surfing areas in South Africa. Situated on the east coast of South Africa with a coastline stretching over 220km from the Mozambique border to Port Shepstone, it is home to some of the best waves in the country. Durban is better known as surf city and North Beach was host to the famous Gunston500, a world tour surf contest, up until the late 90’s that drew major international attention. The contest then moved to Ballito on Durban’s North Coast and is now a 6 star World Qualifying Series event. Durban beach front and the North Coast up to Ballito is littered with hotels and bnb’s, from super luxury to budget South Africa surf camp accommodation, you’ll find places perched right on the beach. The warm Mozambique current flows along this vast coastline of tropical beach breaks for all levels, giving the water an average temperature of 26°C year round. The Durban area and surrounding North and South coasts come alive between January and March when the cyclones hit Mozambique. These storms push easterly swells along the perfectly lined sandbanks that make for absolute epic conditions and attract some of the world’s best. It is no surprise that Durban has produced so many world-class surfers, due to its supreme waves. A surfing holiday in Durban will be filled with sunny days, warm water and perfect surf. Make sure to get yourself a bunny chow from the local oriental market after your surf, it’s one of the local Indian delicacies you have to experience! The Wild Coast, otherwise known as the former “Transkei”, is one of the most tranquil and untouched areas of South Africa. Surfing the Wild Coast of South Africa is definitely for the adventurous at heart. Rolling green hills, deep valley gorges, dirt roads with no signage, river crossings, livestock and rustic rural communities are only a few of the delights you will find along the way to the magical hidden surfing beaches along the Wild Coast. Better know breaks for the experienced surfer include, Port St. Johns, Mdumbi Point, Coffee Bay and Breezy Point. For the beginner surfer you will find untouched beach breaks all along this vast coast line. Coffee Bay has been hosting travelling surfers for decades and only a 3 hour “Bazz Bas” ride from Durban, you can be in to a few waves and a couple beers around a camp fire in no time. The beaches are pristine with hardly a footprint in sight. At low tide you’ll be able to pick lobster or crayfish right out of the rock pools. Coffee Bay is your best bet for accommodation with Coffee Shack Backpackers a stones throw from the water’s edge and one or two decent self catering hotels in the area. Mdumbi also has backpacker and campsite accommodation which is run by locals, here you can stay in local luxury huts called rondawels. The waves are extremely consistent and probably surfable 300 days of the year. If you looking for surf lessons in Coffee Bay there is a surf school right on the main beach. One of the better-known sights along the Wild Coast is a place called Hole-In-The-Wall, which is about an hour drive from Coffee Bay. On occasion there are waves that break through the hole in the rock that run through to the secluded, un-spoilt beach. Surfing Hole-In-The-Wall and surrounded by the beauty is a truly humbling experience! Crossing the great Kei River from the Wild Coast will bring you into the Eastern Cape of South Africa. These lazy, quaint little towns of Morgan’s Bay and Kei Mouth are better known for fishing as opposed to surfing. The waves in this area are raw, powerful and completely uncrowded. Less than an hour drive away you’ll come across the East Coast Resorts area. This part of the coast is littered with reeling right hand point breaks and beach breaks for all levels. East London is 20 minutes away and has some of the most consistent waves in the entire country. Nahoon beach is great for beginners and Nahoon Reef is a bowly right hand point break that has been compared to Sunset in Hawaii. Eastern Beach is another one of those East London surfing spots that can get really good on it’s day. This area is teeming with quality waves all within a 20 min drive. Further up the coast is the quaint little fishing, holiday town called Port Alfred. East Beach is the most popular surf spot, a reeling right sand bottom break, which runs along the east pier. West Beach is a powerful wedge beach break and often frequented by thrill seeking body boarders. If you in the area make sure you get yourself a famous Beavers pie as you head out of town. 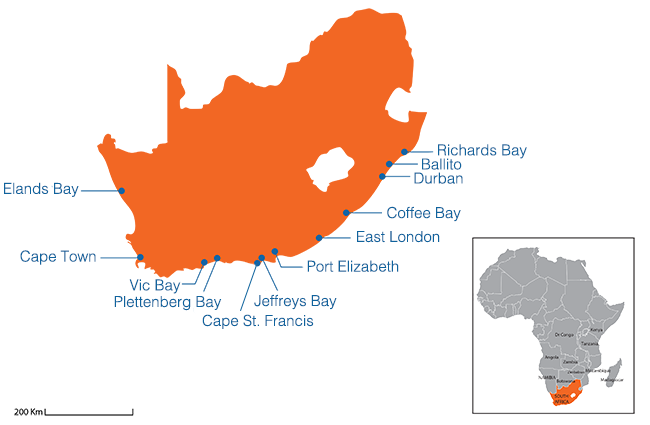 Port Elizabeth is your next stop before the famous Jefferey’s Bay. With JBay only 45 minutes away it has always taken the limelight, but PE does get its fair share of good waves and is an ideal spot for a South Africa surf holiday. Surfing JBay is something every avid surfer has on his bucket list. Besides the most famous surf spot, Super Tubes, Jeffrey’s has many other breaks catering for all surf levels. To the left of Supers is The Point, a long slow right-hander, often frequented by long boarders. Kabelouws is a beach break at the end of the bay where you can find waves all to yourself. To the right of the main break is Tubes, also a fast hollow right hand break and less crowded than the other waves. The main beach at the end of the town is where you can pick up a few surf lessons in Jefferey’s Bay. J-Bay has a buzzing nightlife, especially during winter months when the swell is in town. Expect lots of live bands, quality sea food restaurants, great pizza venues, coffee shops and some excellent bars all filled with surfing memorabilia. If only some of those walls could talk, so many great stories would be told. You’ll find a good variety of South Africa surf camps and all sorts of other accommodation in JBay from luxury bnb’s, self catering apartments and backpackers right in front of the main surf breaks. If you drive further up the coast past Paradise Beach you eventually get to Cape St. Francis. The infamous Bruce’s Beauties, which was filmed in the Endless Summer movies, is still there, but only breaks certain times of the year. The beach break at St. Francis is world class and often the go to spot when the pros are in town and the surf is small. Seal Point is a super fun right hand break that wraps into the bay and offers the ultimate canvas for high performance surfing. A true hidden gem! As soon as you cross the Storm’s River Bridge you’ll know immediately you are in the Southern Cape and the start of the famous Garden Route. Mountain ranges as far as the eye can see, tall indigenous forestry and epic ocean views, are just a few things you can expect to find along this route. If you adventurous at heart, then bungee jumping off the Bloukrans Bridge, one of the highest bungee jumps on the planet, is a good way to get the adrenaline flowing before getting a taste of some of the perfect waves along this coast. Surfing in Plettenburg Bay is a mixture of beach and reef breaks all littered along the vast coastline.The Wedge in Plett is the most famous and very popular amongst body boarders. About 30 minutes up the road is Knysna, although not known for its surf, it is a great place to spend the night in one of the many luxury bnb’s and experience the beauty of the place. Knysna’s annual Oyster Festival in July is a definite must see. Further along you’ll come across Wilderness, with jaw dropping ocean views as you wind your way through the majestic mountain passes. The surf in Wilderness comes from raw ocean swells and can hold some seriously big waves. As you exit the mountain pass you will find an enchanting little bay, called Victoria Bay. As you wind down the valley towards the perfectly shaped bay surrounded by thick mountain vegetation, you can’t help getting a sense of excitement as if anticipating a unique discovery. Surfing Vic Bay is an exceptional experience! It’s a right hand point break that wraps into the small bay along a boulder like reef and links up to a great little beach break for all levels. Mossel Bay is another outstanding town for surfing in the Southern Cape. Outer Pool is a standout and can serve up long walls with hollow barrel sections during low tide. There are many other surf spots around Mossel Bay catering for all levels. Still Bay is the next spot along the coast and can also get some exceptional surf. Getting closer to Cape Town there is the town of Hermanus, better known for its whale watching, but can also get some excellent surf. Surfing the Garden Route of South Africa is a trip of a lifetime and if you have a couple of days to explore all nooks and crannies, you’ll find some outstanding uncrowded waves! Cape Town’s beauty truly speaks for its self. The famous Table Mountain as your backdrop where ever you go makes for unbelievable scenic drives along Cape Town’s Atlantic seashore. Starting on the False Bay side, you have Muizenberg beach, where it all started. The surf in Muizenburg is perfectly suited for beginners as the waves softly roll in from far out on a shallow sandbank. Muizenberg currently holds the World Guinness Record for the most surfers to ride a single wave, more than 120 surfers were recorded on one wave. Around the corner from Muizenberg are St. James and Kalk Bay Reef. Kalk Bay is a hollow, short left-hander breaking on a kelp reef bed. Surfing Kalk Bay is only for the advanced surfer. There is a really cool pub in the small harbour at Kalk Bay which looks right into the barrel of the wave. If you continue around the Peninsula and get to the Cape of Good Hope where the Indian and Atlantic Ocean’s meet, here you’ll find secret coves and bays with perfect surf around every corner. On the Atlantic side you will come across a small fishing/surfing community called Kommetjie. The water is a lot colder on the Atlantic side and Long Beach is the ideal location for the whole family. The waves wrap into the bay along the perfectly formed kelp beds and sand banks creating flawless A-frame peaks. Predominantly a left hand break it is frequented by young surfers and more a long boarding type of wave. There are many exceptional surf spots around Kommetjie. Outer Kom, a world-class left break with big walls and wide-open barrels, is one of these spots not for the faint hearted. Witsands, Scarborough, 365’s are all within a few kilometers apart and also great options if you looking for empty perfection. Heading towards Cape Town and just before you get to the infamous Chapmans Peek Drive is the quiet village of Noordhoek. A wide-open beach with perfect A-frame peaks along the whole 1mile stretch. Dunes, is a perfect peak way down the beach and has often frequented surf magazine covers. Driving along Chapmans Peak is one of the true wonders of the world and you eventually end up in the small fishing village of Hout Bay. Better known as a big wave spot outside the protected bay called Dungeons. Dungeons can get up to 30ft+ waves and is a favourite amongst big wave surfers when those massive Atlantic storms hit the coast. If you head through Hout Bay you get to a small, secluded cove nestled between colossal luxury homes forming an amphitheater overlooking a perfectly sheltered beach. The water is exceptionally cold in Llandudno averaging 11°C, but the waves are red hot. Crystal clear conditions and hollow peaks both to the left and right make it super fun for surfers of all levels. If you continue along the M6, which winds its way along the coast, you’ll eventually get to Camps Bay with its white sandy beaches and lavish cafes and restaurants. It’s a great way to unwind and enjoy a few sunset cocktails after a long day surfing! If you make your way towards Cape Town City Centre passing through to Cape Town’s Waterfront, here you can spend an entire day soaking up some culture and sampling many of the excellent bars and restaurants. At the other end of the bay you will find Table View and Bloubergstrand with wide-open beaches where you can find a peak all to yourself. This part of the coast is very good for wind surfing and kite surfing, especially when the dominant easterly “Cape Doctor” wind comes to town. For a good day trip you can take a 2,5 hour drive up the Western Cape coast to a small fishing village called Elands Bay. Elands Bay is a long, left-hand point break where you can get rides for over 300 meters. Surfing in Cape Town and the Western Cape will leave you feeling humbled by the experience. Be careful though as you might not leave the place! South Africa has an extremely unique climate with vast differences between the west and east coasts, sea temperature and weather wise. Here is a weather guide to best equip you for a Surfing Holiday in South Africa. The water temperate in and around Durban has an average temperature of 26°C. The warm Mozambique current attributes to this and generally you can be in baggies or a short wetsuit all year round. During winter months (May - August) the wind chill could be a factor in the mornings and you can bring out the spring suit (short arms and long legs). The water temp generally won’t get below 20°C. The northern part of the Wild Coast can still get very warm water at around 22°C. Further south you’ll need to start bringing out the fuller wetsuit as it can drop to around 18°C. The Eastern Cape can get warm spells when that Mozambique current brushes the coast, but generally it averages at around 18°C. A full 2/3 wetsuit is recommended all year round. The water temperate can reach as low as 15°C during winter months (May - August) in places like JBay, although not that often. The Southern Cape is very similar to the Eastern Cape in that you would need a full suit all year round. You might also get the occasional really cold day in winter when it can reach 15°C or lower. The average water temperature for the Southern Cape is 17°C for most of the year. The Indian Ocean side of the Western Cape can get quite warm and up to a max of 16°C to 18°C. However, the Atlantic side can get really cold in parts and as low as 12°C. A full 4mm steamer is the recommended wetsuit for most parts of the Western Cape. For a more detailed look at when & where to surf in South Africa for your surf level use our Surf Trip Finder. Then browse each destination to discover the best selection & lowest prices. We have a great choice of accommodation & lessons in South Africa's best surf towns. Book your surf holiday online now!